It has been a remarkable quarter – and remarkable year – for our Association. We have continued to establish ourselves as a highly visible, highly respected name in the global blockchain community and have welcomed over 200 members in the last two-and-a-half months, bringing the total to more than 550. This is of course gratifying and validates the hard work we put in every day disseminating information and contacts to startups and investors, answering questions and interview requests from international media outlets, organizing events, participating in the blockchain-based policy debate in Switzerland, publishing news and opinion from and about our community, and building Crypto Valley’s reputation through attendance at events around the world. All of us directly involved in running the CVA do so as volunteers. We are passionate about this community and strive to do the best we can to add value for our members. While I personally am proud of what we achieved so far – the list of activities and achievements in this newsletter is considerable – there is no doubt that, after only nine months since establishing the CVA, we are only just starting our journey. Our mission remains unchanged: to build the world’s leading ecosystem for blockchain and cryptographic technologies in Switzerland. While 2017 was about establishing our footprint, 2018 will be about scaling up to deliver upon that mission. We will hold our inaugural Crypto Valley Conference in June, the Association will see its first full-time staff, we have our first local Chapters and our Working Groups have set themselves even larger objectives. This has been made possible by the introduction of Strategic Partners and Supporting Partners programmes, and the decision at the Special General Assembly in October to raise Corporate Member fees. I encourage all members to contribute to the Working Groups if you are not already. Participation is the best way to get value from your membership. 2018 promises to be another great year for the evolution of the technology, the Association and the Crypto Valley ecosystem, and we look forward to continuing on this journey with you. On behalf of the Board, please let me wish you and your family season’s greetings and a Happy New Year. You can read the full newsletter here. There is NO official CoinMarketCap mobile application at this time. 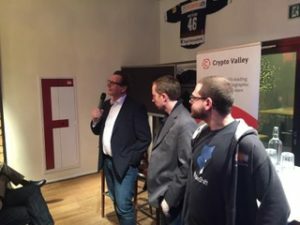 Along with the highly successful Crypto Valley Forum and its first Tuesday Meetups, the CVA has introduced a CVA-sponsored Quarterly “Special Event” series intended to showcase important blockchain companies and leaders in our ecosystem. The first one, which attracted more than 140 participants, was held on 11 December and featured ShapeShift. Founded in Switzerland in 2013, ShapeShift is the fastest and safest digital asset exchange in the world. On the platform users can directly exchange cryptocurrencies for each other without opening an account and without the exchange ever holding the customer’s funds. The company was represented by CEO Erik Vorhees and COO Jon, and the fireside chat was moderated by Nicolas Brand, Partner at Lakestar, one of ShapeShift’s investors. 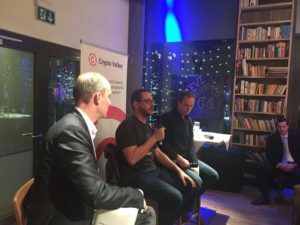 During the discussion it became clear the ShapeShift business model has been very successful, both its cryptocurrency exchange and the company’s Prism product, which uses smart contract to construct a “platform upon which humans and machines can acquire exposure to portfolios of digital assets without trusting a counterparty.” As a result of growth the company said it would be expanding their office in Zug. The chat also contained a very engaged discussion of the future of cryptocurrencies. 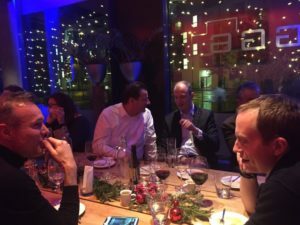 On 11 December, the CVA was invited to attend the Swiss government’s second Fintech roundtable. 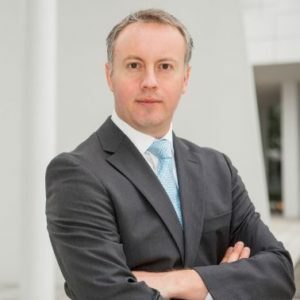 This new roundtable, which is chaired by the Swiss Finance Minister, will meet twice a year to bring together important stakeholders in the Swiss Fintech industry – including the Swiss regulator, associations like the CVA, universities, banks and insurance companies – to facilitate exchange between on important Fintech topics in Switzerland. Bussmann also said that the Swiss government is working on a digital ID scheme for the country. The Fintech sandbox that the Swiss regulator introduced this year has been off to a good start. There are five projects active in it, and over 300 requests for clarifications. Of these, said Bussmann, about a quarter are blockchain-related. We’re joined by Christopher Fabian, Co-founder of Unicef’s Innovation Unit. We discuss how the global non-profit institution leverages innovative technology to solve real-world problems in humanitarian work. We explore the different applications of blockchain in the UN and Unicef, as well as the challenges we can anticipate when deploying these technologies in the developing world. Shaun Conway, Founder of Ixo Foundation, also joins the discussion as a startup working Unicef and talks about the value of a global reputation network for humanitarian projects.